Clean and comfortable. This unit is so well equipped. Just like home! Artwork and accessories are tasteful. The town home was very nice, we enjoyed staying there. The kitchen was well stocked with pans, cookie sheets, etc. Thank you for the great service! This is a very nice property. Cleanliness is a 10! The condo was very clean! Great directions from the airport. Sunset Ridge 729 __ The cleanliness of the property was excellent! Very comfortable house and yard in a great location. Calle Catalina __ 10s across the board. Cleanliness, impeccable! Your service and the quality of the home were on point and much appreciated! We loved the condo. All the small details made our stay a wonderful one. We love to cook and really did not miss a thing in the kitchen. The decorations was exquisite. We rent a lot of apartments but this one is by far the best. Thanks for having us here. We stayed in Feb 2016. This unit was terrific! Household supplies were well supplied. 10's across the board! The cleaners did an excellent job! Kimber was extremely helpful. Ease of making reservations was the best. Whole experience was a 10! WiFi was great. Location was great. Neighbors were very warm and hospitable. Appreciated having soap, toilet paper, tissues, etc. Thanks for a great stay! We hope to return to the same next February! Condo was very well supplied. Ease of arrangements was wonderful. Corby was always available and very helpful! Overall a great experience! This was great and makes us never want to stay in a hotel again. Really appreciate the property and your crew. Thanks! We were extremely happy when we entered Condo #10205 on 1 January, 2016. The unit looked just like the photos posted on your web site, only better in person. "Clean and fresh" comes to mind when I think about that day, also very truthful advertising, as it was not misrepresented at all. The welcoming package put together by Corby was impressive and well thought out. Also, the bathrooms were well stocked and sparkling clean. The complex, Boulder Canyon, is located just off of major north south highway, a few miles north of Tucson and within easy walking distance of several "fast food" restaurants and major grocery store and drugstore! We have the condo for two months and would stay longer if our schedule would allow it. Brenda was ecstatic when she opened the front door and entered our new home. Would be happy to recommend this unit and Solterra Luxury Rentals to anyone for assistance in obtaining a luxury rental for their stay in the Tucson area. We are extremely happy with our stay! December 2015 Villa de Centro __Wonderful amenities in the kitchen and laundry. Very comfortable beds. Cleanliness of the property a 10! December 2015 Pitching Wedge __ Making us feel at home was important and you succeeded! Thank you! March 2015 Pitching Wedge__ Your customer service has been excellent. Thank you! Nov 2014 Ventana Vista 1107__ Everything clean and well equipped. Very quiet. Traveled with elderly Mom so appreciated the layout of the 1st floor condo. One bed and bath on each side of the open plan kitchen/dining/living room gave all of us the privacy we wanted. Outdoor table for morning sun. 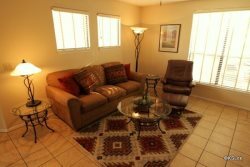 About 1 block to pool/hot tub, 12 minute walk to Sabino Canyon where there are miles of trails for desert Canyon walking. 10 minutes by car to grocery and plenty of restaurant choices. Gas, newspaper and drug store a 10 minute walk away. A perfect fit for the three of us. Feb 2014 Canyon View 14184_ Best stocked condo we have rented! Loved the new towels and sheets. Very comfortable stay - wonderful complex.